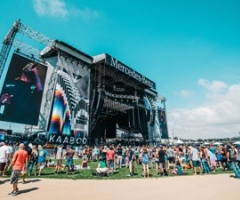 KAABOO Del Mar 2017 hit the ground running, with the full MIX-perience firing at all cylinders the minute the gates opened to the public on Day One. 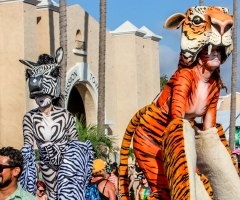 Looking around the grounds was almost overwhelming, with so much to take in: artists erecting enormous masterpieces, entertainers absolutely slaying each of the six stages, and hired acrobats weaving, dancing, catapulting, hula-hooping, stilt-walking and breakdancing all around attendees. It got to a point that the festivalgoers were garbed in such bizarre attire that it was difficult to decipher who was working the event or just enjoying it! Notable Day One moments were Shaquille O'Neal DJ-ing an 80's hair metal mash-up (who knew that's how he rolled?? ), Kelis loading a food processor (ditching her typical blending ways), Kesha frenching her onstage cohort (man toy? 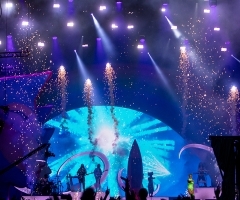 ), Ethan Tucker performing in an air stream, David Guetta's pyrotechnic dance party... and then, of course, there was the Red Hot Chili Peppers. 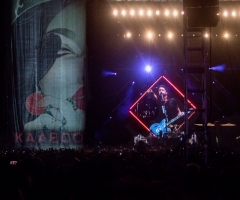 To revel in 3rd Annual KAABOO memories, read our weekend recap and stay tuned for Day 2 and 3 KAABOO photo galleries coming soon. Don't forget that early bird tickets for KAABOO 2018 are already on sale! Secure your tickets now at www.kaaboodelmar.com.